Sara Illsley, front, and Ruth Cutcher perform "Bésame Mucho" at the Durango Choral Society Cabaret on May 16 at the Durango Arts Center. Illsley once met the composer of the song. 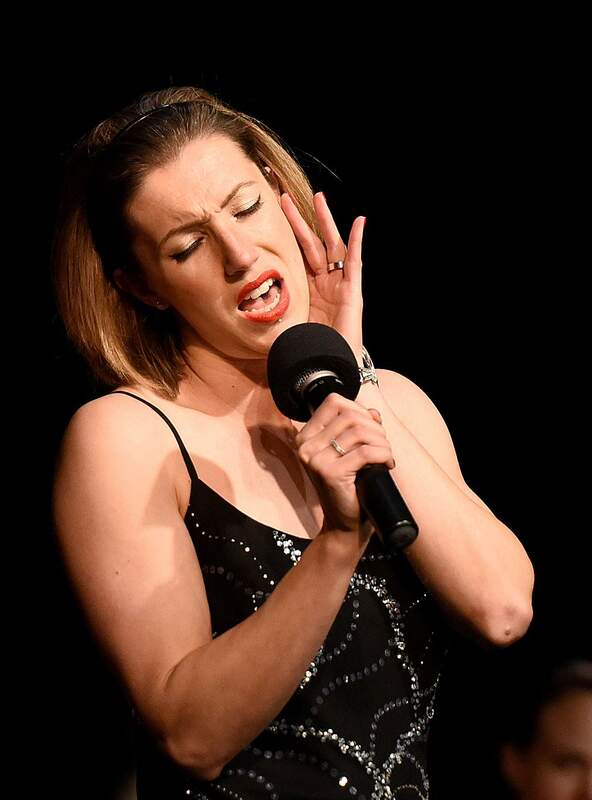 Sarah Choczyczk sings "Cry Me a River," at the Durango Choral Society Cabaret on Nay 16 at the Durango Arts Center. Durango Choral Society Music Director Linda Mack Berven conducts the auction at the organization’s Cabaret on May 16 at the Durango Arts Center. One would never know from looking at her that she had an emergency appendectomy six days earlier. 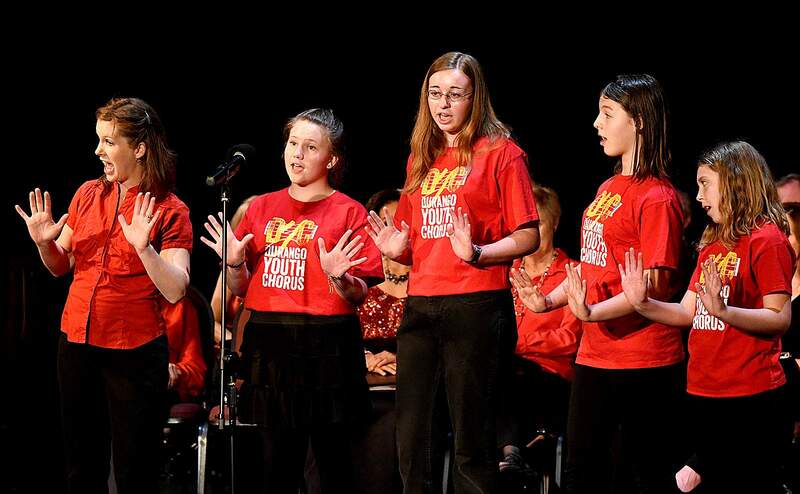 The Durango Youth Chorus sings “The Frim Fram Sauce,” at the Durango Choral Society Cabaret on May 16 at the Durango Arts Center. From left are director Amy Barrett, Deana Lancaster, 12, Anna Haverly, 15, Kate McCourt, 13, and Amiah Hanson, 9. 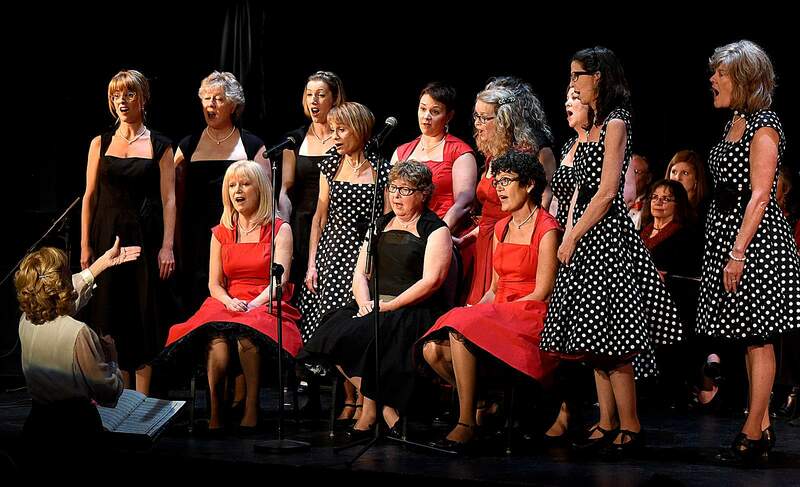 Members of the Durango Women’s Choir sing “Sunrise, Sunset,” at the Durango Choral Society Cabaret on May 16 at the Durango Arts Center. Alison Dance, second from right, was the soloist on the number. The Jewel Tones from Telluride sing “I'm Always Chasing Rainbows” at the Durango Choral Society Cabaret on Nay 16 at the Durango Arts Center. From left are Ginny Fraser, Amy VanDerBosch, Karla Brown and Anna Robinson. The group was invited back after wowing the audience at last year’s Cabaret. That old adage of “The show must go on,” was the motto of the evening on May 16 as the Durango Choral Society presented its annual Cabaret fundraiser. Barrett is the music director of the Durango Children’s Chorale, the new Durango Youth Choir and Durango Narrow Gauge Barbershoppers. It was the Youth Choir that was scheduled to be onstage at the Cabaret, and Barrett was there not just to conduct, but to sing “The Frim Fram Sauce” with Devin Acevedo, Amiah Hanson, Anna Haverly, Deana Lancaster, Kate McCourt and Emma Vigil. As for the appendectomy, DCS Music Director Linda Mack Berven had an emergency operation the evening of May 11. Because she had been feeling ill for two weeks, she said she felt better immediately, but still, it was surgery. The only indications she was still healing were that she sat to rest more often and hugged a little more gingerly. The Hospitality Committee, headed by Michelle Hegenwald and Sydney Morris, included Debra Lehl and Abby Bowen. Between their cooking marathon and food from Chuck Norton Catering, guests enjoyed quite the spread, including mammoth fruit, cheese and veggie platters, bread bowls with spinach dip, chicken skewers with pineapple, chicken salad sandwiches, a carving station with beef, pork and turkey, with some of those condiments Norton’s is known for, desserts including cream puffs and other goodies, and a wide selection of truffles courtesy of DCS Executive Director Dawn Spaeder. On the say-it-isn’t-so side, a huge tray of crab cakes was stolen from Hegenwald’s car as she was unloading, crab cakes it took her four hours to make. Sometimes I just don’t understand people. In yet another show of generosity, Stan Crapo of Star Liquors was the event sponsor. Steve and Marti Kiely also continue to be quite generous. In addition to buying dinner for the performers pre-concert and going in with Wynn Berven to buy a conducting gig for Fort Lewis College President Dene Kay Thomas at the DCS Christmas concert on Dec. 6, Steve Kiely had a lot of fun during the ask to the audience to make donations to support the organization, as Megan Lopez vamped her way through the audience. One of the most fun things about this event is that we get to hear the superb soloists from within the choral society. Sarah Choczyczk wowed once again with “Cry Me a River.” I told her I’d kill for her voice, so if she ever ends up voiceless, she’ll know what happened. 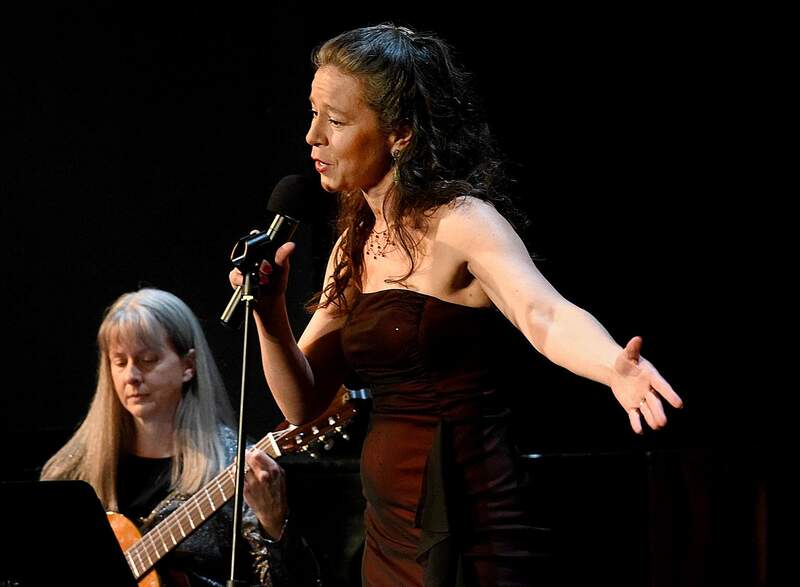 Lucy Johnson handled both the delicacy and bravura of “Maybe This Time,” from “Cabaret.” Sara Illsley, accompanied by Ruth Cutcher on guitar, sang “Bésame Mucho” the way it’s meant to be sung, not as a quick-paced pop song but a measured pace with a bit of lamentation. Illsley told me she once had the honor of meeting composer Consuelo Velázquez, who told Illsley that her entire family had lived off the royalties of that one huge hit song. The Jewel Tones, an all-female a capella group from Telluride reprised their role as guest artists to great acclaim. 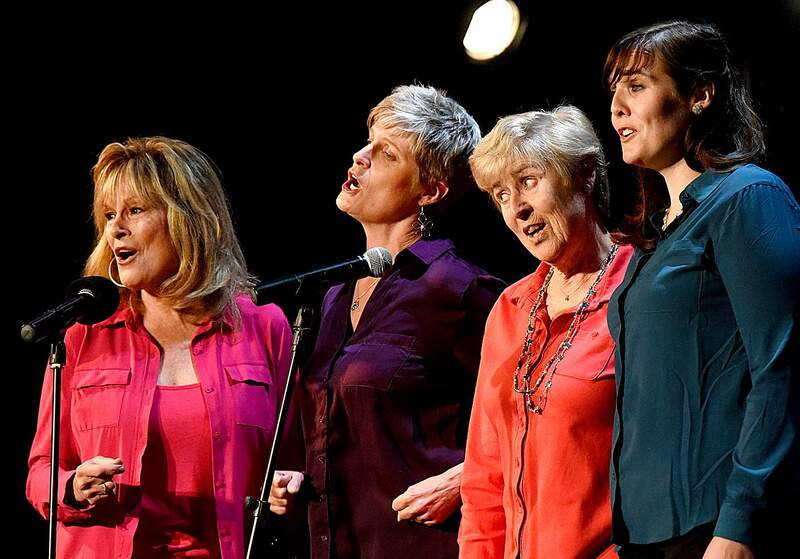 After putting the Andrews Sisters to shame on “Don’t Sit Under the Apple Tree,” the went on to shine on “I’m Always Chasing Rainbows,” “What’ll I Do” and “When I’m 64.” Karla Brown, Ginny Fraser, Anna Robinson and Amy VanDerBosch are welcome back anytime as far as I’m concerned. The Durango Choral Society Cabaret maintains its standing as one of the most entertaining and memorable fundraisers of the year. Bravos to one and all!